In mid-September, Dr. Michael J. 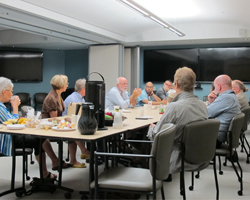 Strong held his first Conversation and Coffee session at Victoria Hospital. Twenty faculty members had an opportunity to hear first-hand about some of the key initiatives underway for Schulich Medicine & Dentistry, and to learn about some of the latest achievements that support the School’s research and education mission. Faculty took the opportunity to ask questions of the Dean on a wide variety of topics including the ongoing work and changes taking place in Schulich Dentistry, the School’s medical education curriculum and how it’s preparing students and residents for the future, recruitment, and the future physical plant of the School. Please register by email to Jennifer Parraga, Director, Communications & Marketing, indicating the session you will attend.